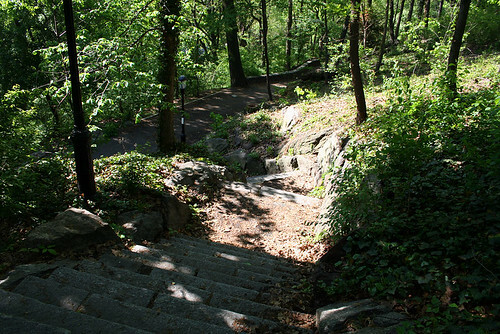 This set of Friday Photos is brought to you from The Hike, straight up the hill, to The Cloisters through Fort Tryon Park. 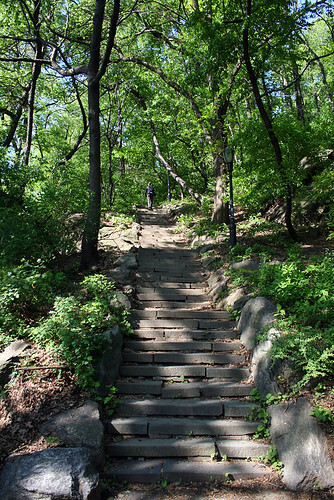 The Stairs Begin to Curve. The Spot Where You Stop and Pretend to Admire the View, as Your Heart Jumps Around in Your Chest. 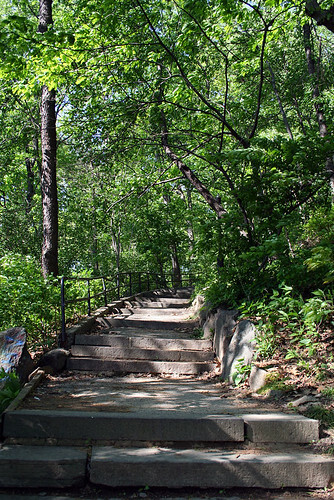 Oh Good, One Last Set of Stairs Until it's Over. 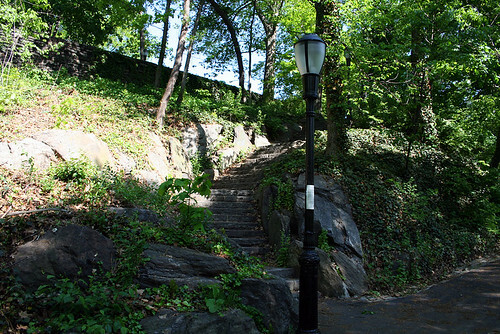 Editor's note: If you double click on the photo then open the original size, at the top of the stairs to the left near the lamp post, you'll see a perfect stone for sitting. Not that one needs a place to sit for a while, I'm just mentioning another spot to admire the view. Unfortunately, When You Get to the Top of the Stairs, You See This. Fortunately, It is the Last Set. Once More, Here's the View from Above. And Why Would Anyone in Their Right Mind Climb these Stairs? 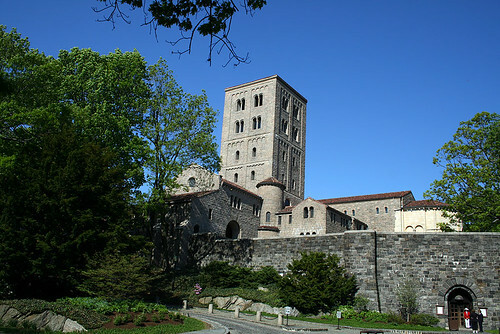 Why to See The Cloisters. And then Suddenly it Turned to Night, so I Snapped a Shot of That Too. 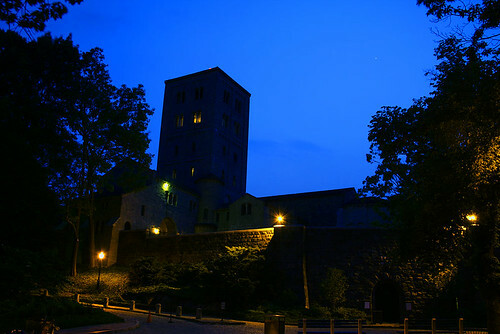 Question: Is there a way to see The Cloisters without climbing the stairs? Answer: Yes, but it is the wimpy way. 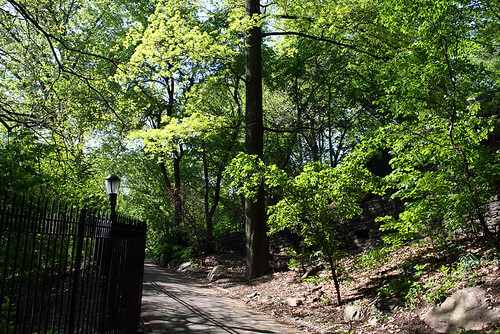 Take the A train to 181st Street, take the elevator up to the top of the hill, detour around the panhandler asking for $$, then walk through the park 15 minutes to The Cloisters. Question: Isn't there something that can get me closer? Anser: Yes, a cab..................Well, actually, there is a bus, but you're on your own figuring out which one. ............Okay, okay, I'll play nice. Use THIS, to help find your way. There. Are you happy now? I bet that cliff was a nasty surprise. As for the stairs, I think they're more unforgiving on one's thighs. Unless of course you're wearing flip-flops. And yes, the view was both lovely and thoroughly enjoyed. I love the Cloisters. Very romantic place. I wouldn't ever go during the winter, tho. Good point Kitty, I wonder how they heat that great heap of stone in winter. My mom's home has radiant heat in the floors, so during winter her place is nice and toasty. Somehow I doubt that The Cloisters utilizes the same system. 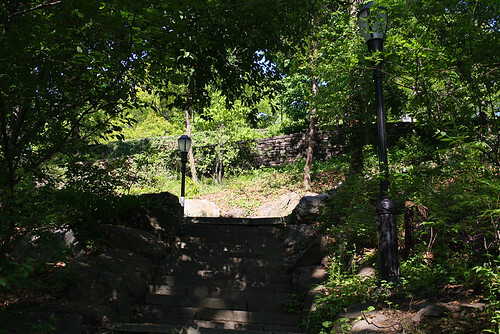 Living on the other side of the park, I find going down the stairs can be harrowing as well with the 88 degree pitch and no handrails. 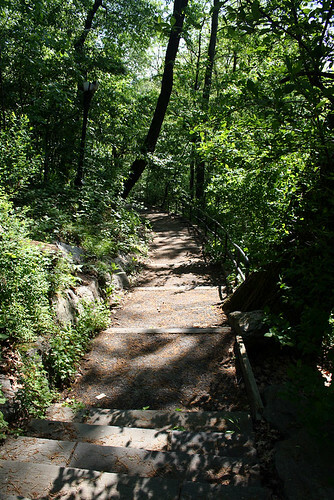 A couple of times as I've precariously jogged down the steps, I've thought I was about to fall. It can get tricky.